I love Christmas time! And one thing I love almost as much as Christmas time is BREAD! I have alllllways loved bread! That, paired with GOOD butter is a taste of Heaven! And yes! REAL, salted, GOOD butter matters!! Growing up and visiting my dad’s parents in Minnesota and Wisconsin, the one thing I would always remember was how good my Grandparent’s house smelled. It always has fresh baked bread and the distant smell of the Cardamon spice lingered in the air. My Grandmother is from Oslo, Norway and came to the United States when she was a teen during WWII. She met my Italian Stallion of a grandfather in New York City where they fell in-love and began a family. Her rich Norwegian heritage is everywhere throughout their house. 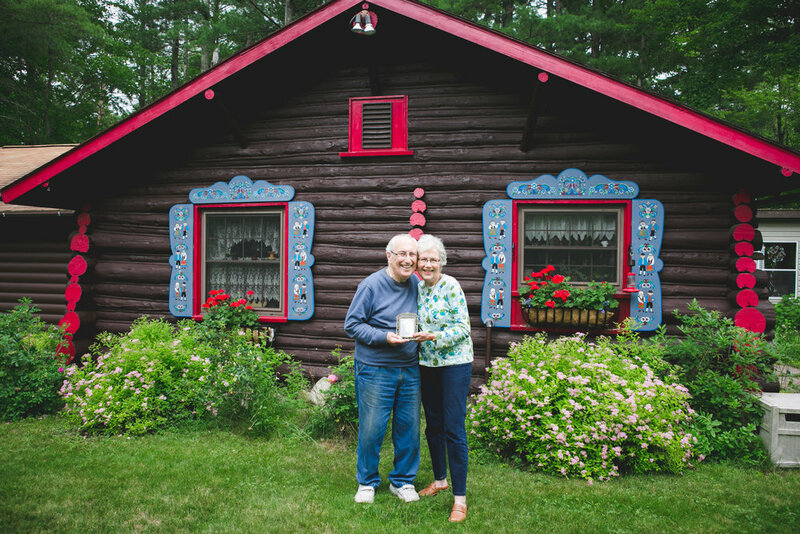 It is even hand painted on the shutters of their adorable log cabin. I love their house and I love visiting and so wish we weren’t hundreds of miles apart from each other so I could visit more. My parents are currently visiting and my mom surprised me with the ingredients for the Norwegian Christmas Cake, Julekake (pronounced: yule-i-ka-ka). It means: yule bread. This bread has the spice Cardamon in it, which reminds me soooooo much of my Grandparent’s house. I had been wanting to learn how to make this forever and finally did. It is SOOOO delicious and will leave you heading back for another slice. Not to mention, it leaves the house smelling DIVINE! I adjusted the recipe below from this recipe. ENJOY! Pour hot water over the raisins and let them sit to soften. Scald milk in saucepan on stove (180F degrees). Do not boil. Once milk has scalded, remove from heat and add butter, sugar, salt and cardamom. Add yeast and eggs and mix well. Make sure your scalded milk mixture is not too hot so eggs do not cook. Add 4 cups flour and beat well. Cover mixing bowl with plastic wrap, poke holes with toothpick on top and let rise in a warm place for about 1 hour until dough is bubbly. (Tip: I place my dough on top of a heating vent and surround the base of the bowl with a towl.) Add mixed fruit (if desired), raisins and the rest of the flour. Knead dough with your dough hook or on a lightly floured work surface. Butter your mixing dish and place dough back in a warm spot to double in size. Punch down dough and divide into 3 parts. Make 3 round peasant loaves or put into three bread pans. Place loaves on parchment paper on jelly sheet and let rest while the oven pre-heats to 350 degrees. Bake for approximately 45 minutes until loaves are golden brown on top. Brush tops with melted butter while hot. To store, wrap in foil and store at room temperature. Will keep for one week. Michelle Newell is a wife, mother, adoption advocate, professional PNW based photographer, fitness wannabe, DIY junky, gardener, piano playin' singer, homeschooling mutt living the everyday through Christ.